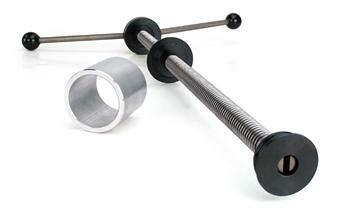 The COMP Cams Roller Cam Bearing Installation Tool is the tool of choice for many professional engine builders. This tool allows roller cam bearings to be professionally installed in most engine blocks. The kit includes a draw bar, swivel handle, alignment head and a 50mm bearing head. Other bearing heads are available separately. These bearing spacers allow 350 Chevrolet crankshafts to be installed into 400 Chevrolet blocks. Absolutely no machine work is required for installation; simply snap them in and install standard 350 bearings. You save the cost of buying thicker, more expensive bearings.